This is Part #3 of a new blog series on The Three Luxury Real Estate Marketing Keys for Personal Branding. Define. Align. Refine! Pottery, as an art form, clearly illustrates the principle of feeling centered which is the by-product of the process of self definition and personal alignment covered in previous posts. As students of pottery, we highly recommend that luxury real estate marketing professionals take a pottery class to gain a visceral, hands-on experience of centering. Like the personal alignment process pottery is also a meditative experience because you have to concentrate and focus to keep the clay centered on the wheel as you transform it into something both beautiful and useful. You cut a piece of clay from a large block and wedge the clay. That is, you knead the clay until all the molecules are literally aligned and no air bubbles remain in it. This will add to the structural integrity of the finished bowl. You start the wheel, flatten the ball, and center the weight of the mass on the wheel. If the clay is not kneaded or wedged properly air bubbles will remain. Air bubbles will create holes or cracks when you fire it in the kiln. The personal alignment process is similar to wedging clay. It is essential that you rid yourself of the air bubbles of doubt and self contradiction. You center the clay mass on the wheel in order to open the very center of the vase and evenly pull the sides up. Suddenly, from a lump of clay you give it definition and a shape. Centering yourself through the process of self-definition and personal alignment quiets your mind, so that you can focus on shaping, crafting the vase of your unique selling proposition (which we cover in Part 4). The last step prior to firing is called trimming. Once you have let the newly formed vase dry (partially) overnight, you bring it back on the wheel, center it again and trim away any excess clay. This trimming process is akin to what we call refining your marketing message which is covered in Part 5. We find that so many luxury real estate marketing professional do not take the time to establish their personal alignment and get centered. They simply are unable to clearly articulate how they are distinct from their closest competition. And, their results are usually not consistent. 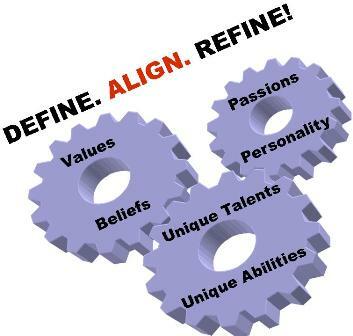 Personal alignment gives you a sense of balance, confidence and a sense of being centered.. Only then can you be authentic and create a genuine personal brand.. This is also part of an ongoing series about Luxury Real Estate Marketing . Get Fluent. Get Affluent! Subscribe to The Language of Luxury by Email or RSS Feed. Comments? Please use form in left column.